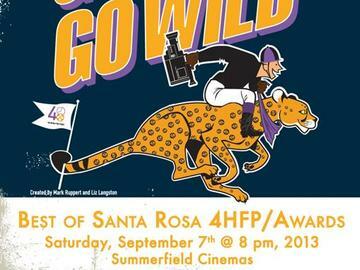 On September 7th, we will be hosting the First Year "Best Of" Santa Rosa Awards Screening at Summerfield Cinemas. The 'Best Of' screening includes the Audience Award winner along with the nominated films and followed by an awards ceremony. Who will win the 2013, "Best Film" of Santa Rosa this first year? Come and find out! Please check our Facebook (facebook.com/sr48hfp) as we will announce the team nominations there, and on our website (48hourfilm.com/santarosa) or (sr48hfp.com). Tickets may be available at the door for $10 cash/credit/debit. Tickets can be purchased online until 3 p.m. on the day of the show. Tickets will be available at the box office until Showtime or until sold out. The films in this program are not rated. Parents of small children are advised that not all of the content may be suitable. P.S. Team Leaders and VIP ticket holders please remember to check in with our City Producer so that we know you're in the house.